Fall in Orlando is a little different than the rest of the country. While we may not have a lot of changing leaves, we also don’t have to spend our weekends raking our lawns either. That means more time to enjoy the beautiful weather and all of these great activities that Fall in Orlando has to offer! Magical Dining Every September, restaurants around Orlando participate in Magical Dining month, where guests can enjoy a 3 course meal from the finest restaurants in Orlando for $33 a person. Magical Dining is a great time to try out the amazing restaurants around town. Movies In The Park Fall is the best time to pack a picnic dinner and some lawn chairs and enjoy a movie outdoors. Many locations around Orlando host “Movies In The Park” events for free, or for less than the price of a movie theater ticket. 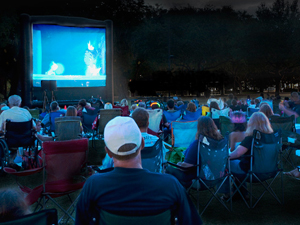 Click here for a complete list of Orlando movies in the park events. UCF Football Games & Tailgating Everyone knows that fall is football season, but did you know that some of the best tailgating in the country happens right here in Orlando? Before every home game, UCF fans go all out with their tailgate set ups at the foot of Brighthouse Stadium. If you’re looking for a great Fall activity, spend the day tailgating and cheering on the home team! Beach Days A major perk of living in Central Florida is that beach days aren’t just for summer vacations. In fact, the best beach days are in the Fall when the tourists have all gone home, the water is still warm from summer, the humidity is lower, and the air temperatures stay around 75-80 degrees. Theme Parks With less tourists, better weather, and special events like Halloween Horror Nights and Epcot Food and Wine Festival, locals know that Fall is the best time to get to the theme parks. Biketoberfest Every October, Orlando gets a little bit louder with the roar of motorcyclists headed to Daytona’s Biketoberfest. Our Fall temperatures make for great riding weather! Festivals Local neighborhoods and towns host festivals during the Fall when the weather starts to cool down. Whether it’s music, art, food, or crafts, you can find festivals all around Orlando! What’s your favorite thing about Fall in Orlando? Being in the video production industry, of course one of our favorite things to do is to watch a good movie. And with the beautiful fall weather in Orlando, the best place to watch a movie is outside! To make it easy for you to find an Orlando movies in the park event, we have put together a list of all of the events hosted around the Orlando area, along with the website & contact information. If you plan on going to an Orlando movies in the park event, call or check the Facebook page for the event before you leave to make sure that it isn’t cancelled due to weather.